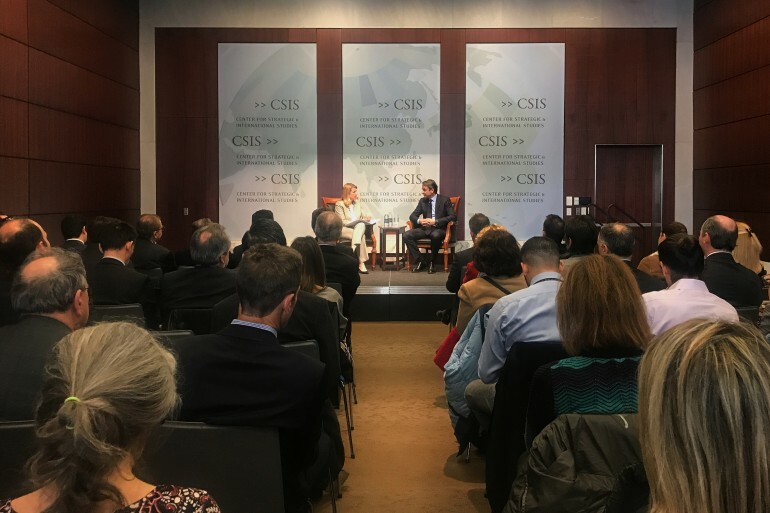 Main opposition leader Kyriakos Mitsotakis concluded his 5-day visit to the United States with a speech on Thursday at the Metropolitan Club in New York City. The event was attended by members of the Greek American business community. Although the invitations were signed by two prominent Greek Americans, RSVPs were made through “The National Herald” – a newspaper closely associated with the Mitsotakis Family. The “NH” was the only press invited at the event and as the “Greek News” has learned, Archbishop Demetrios has not been invited. In his address, the President of the Conservative New Democracy Party (ND) sent the message that Greece will soon change, stressing the need for unity. As he noted, the political debate in Greece is becoming overly toxic for his taste, with personal interests trumping national interests in a way that, as he pointed out, was not healthy for the country. Mitsotakis promised to make strong reforms in order to boost investment to Greece, and to allow members of the Greek Diaspora to vote in the countries they are living. Kyriakos Mitsotakis asked for the immediate release of the two Greek soldiers being held in Turkey, sending a message that Turkey should avoid actions that undermine good neighbourly relations. “We have noticed an increase in Turkish provocations in the Aegean,” which, he said, was unacceptable. “We are also very worried by the recent incident where two Greek soldiers have been detained in a high security prison because they accidentally entered Turkish territory. I ask again from Turkey to release as soon as possible the two Greek soldiers. If we want to focus on good neighbourly relations, we need to be sure that we are not involved in actions that trigger tension between the two countries. If we want to upgrade relations between us, Turkey should avoid actions that undermine good neighborly relations,” Mitsotakis stressed. The President of the Pan Macedonian Association Stelios Kyrimlis, who attended the event, expressed disappointment because Mitsotakis didn’t mention the Macedonian issue. Pan Macedonian Association is one of the organizers of Sunday’s rally in front the United Nations on Macedonia. 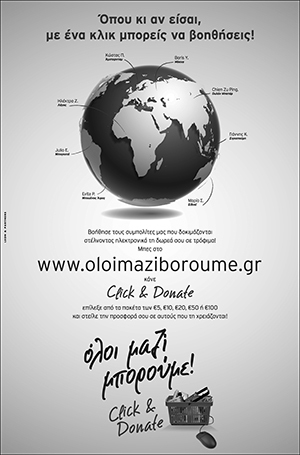 Speaking later on the evening at a large gathering in Astoria, Kyrimlis said “Mitsotakis has spoken about kicking out the anarchists from the Universities, attracting investments and give the Greeks living abroad the right to vote, but nothing on Macedonia. When we asked him after his speech, he said “I must be very careful”. Mitsotakis arrived in New York from Washington, where he had a series of meetings with senior U.S. officials and members of Congress. On Tuesday he met with Republican Senator Mike Lee. According to a ND press release, Lee and Mitsotakis discussed issues concerning the democratic institutions and the rule of law and focused on the institutional interventions of the Greek government. The ND leader expressed his concern over Turkey’s stance on all issues. Lee expressed interest on the two Greek soldiers who are detained in turkey. On the evening he met with Fiona Hill, senior director for Europe and Russia at the White House National Security Council. The discussion focused chiefly on regional geopolitical issues and the Greek economy. 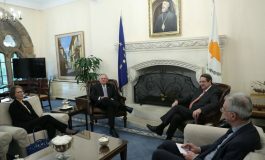 Mitsotakis also discussed with Under Secretary of State Thomas Shannon the Greek-US bilateral relations, as well as recent geopolitical developments. He also met with U.S. Under Secretary of Treasury David Malpass, who showed particular interest in the strategic plan for the development of the economy presented by Mitsotakis, a road map for the day after the end of the programme. The debate focused on realistic reforms that could take advantage of the comparative advantages of the Greek economy and thus pave the way for attracting the foreign investment considered necessary for economic recovery. “The only thing needed is a new government that will guarantee legal certainty and establish an attractive and, more importantly, a stable tax system,” Mitsotakis stated. Malpass explained that the US is seeking economic cooperation with countries that have free markets and an open economic policy. In this context, concrete reforms, such as the reduction of bureaucracy and a stable tax system, could enhance Greece’s investment image and make it a safe business destination for foreign investors, according to New Democracy sources. Asked about PAOK president and businessman Ivan Savvidis and the purported influence of Russia on Greece, Mitsotakis said his interviewer should direct his question to Prime Minister Alexis Tsipras who “was and is to a certain extent in bed with him,” referring to a “cozy arrangement” between the two men. Tsipras wrote off some fines that Savvidis’ cigarette company had accumulated, and in exchange Savvidis expressed interest in buying media outlets that clearly support the government, Mitsotakis said. The next election in Greece is not just going to be about the economy but also about democracy, he said. Tsipras’s legacy will be a “fourth program,” he said, noting that his administration has already committed to additional austerity measures beyond the country’s scheduled exit from its third bailout this August. Asked about Turkey and the recent arrest of two Greek soldiers who crossed the border, Mitsotakis also expressed concern about an “increased level of aggression in the Aegean” over the past month and called on Ankara to respect international law. He called on Ankara to release the two Greek soldiers as quickly as possible. “This is a minor incident. 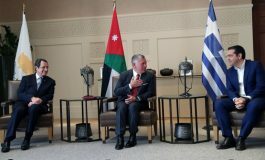 It should not be turned into a major diplomatic episode,” he said but criticized the leftist-led government for underestimating “the importance of the incident” and “talking with two voices,” referring to the different approaches being followed by Prime Minister Alexis Tsipras and Defense Minister Panos Kammenos. “The country needs to present a unified front,” he said. He described Greece as a reliable ally in an unpredictable region. On the economy, he said the big bet is to maintain growth through a different fiscal policy mix based on attracting investments. The reduction of corporate taxation from 29 percent to 20 percent in two years and the implementation of an aggressive reform agenda will be priorities for Kyriakos Mitsotakis, leader of Greece’s main opposition party, if he comes into power. There is a “distinct possibility” elections will take place in the second half of 2018, Mitsotakis said in an interview with Bloomberg TV and added that New Democracy will win. His party is leading in polls and his agenda includes a reduction in the first two years of corporate tax rates to boost investment and a 30 percent reduction in the property tax imposed during the crisis. The country’s economy has cratered with the output shrinking 26 percent since 2008. It expanded in 2017 but it needs investment to reduce an unemployment rate of around 21 percent and recover from the crisis. Mitsotakis also said he is planning to re-negotiate with the country’s creditors the fiscal path agreed on and foresees primary surpluses of 3.5 percent of gross domestic product for each year until 2022. This will come “only after we re-establish the credibility of the country” by first focusing on the implementation of an aggressive reform program, he said. Greece’s lenders are discussing measures that will be agreed for further debt relief. Mitsotakis said that the time has come for it but it’s not just about debt relief. “I think if we do both Greece will be able to breathe again and Greece could be the pleasant growth surprise of the Eurozone,” he added. 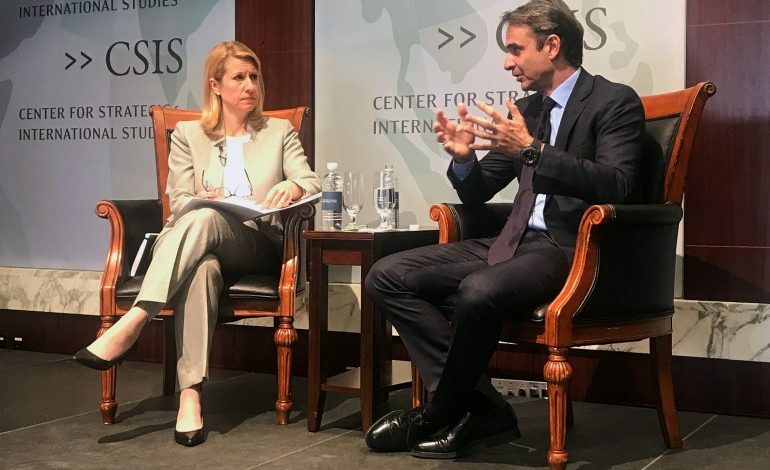 Mitsotakis started his visit from Boston. 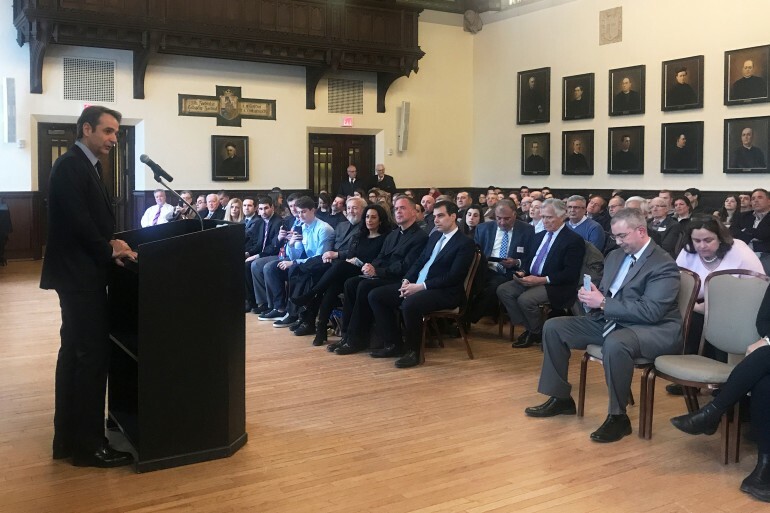 Speaking at Boston College, he said Greece has “already experimented with populist governments and paid the price”. “It was a big disaster. The people of Greece at least know that over-the-top promises will not solve our problems. This is why I’ll take the risk of telling the truth. This is necessary for one to be effective after one’s election. If you undermine your agenda with excessive and false promises, then you will not succeed when come to power. In addition, I think people in Greece can tell if a promise is fake,” he said. 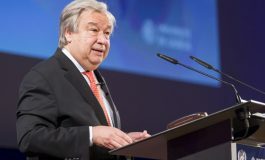 He also spoke of Greece’s economic slump during the economic crisis, saying the country lost 25 percent of its GDP and inequalities widened, forcing many young people to leave the country, in search of a better future.